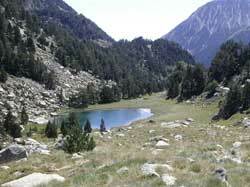 Els Ports de Beseit or Tortosa is an abrupt calcareous massif just inland from the Ebro Delta. The highest point, Mont Caro, reaches up to 1,442m and is readily accesible by road. Apart from the birds this area also has a thriving population of Spanish Ibex, and a large number of endemic plants. Among the animal population, the most spectacular is the population of Spanish ibex (Capra pyrenaica subsp. hispanica), a species that is endemic to the Iberian Peninsula, and which has a controlled population for hunting, managed by the Reserva Nacional de Caça (National Hunting Reserve). Among the other most noteworthy mammals are the otter (Lutra lutra), the wildcat (Felis sylvestris), and the bat group, which with over 20 species is one of the richest bat communities on the Iberian Peninsula. Many different birds also find the ideal living and nesting conditions in Els Ports. Among them are large sedentary birds of prey, such as the griffon vulture (Gyps fulvus), the golden eagle (Aquila chrysaetos), the Bonelli's eagle (Hieraaetus fasciatus), the goshawk (Accipiter gentilis), the peregrine falcon (Falco peregrinus), the eagle owl (Bubo bubo), etc. and those that nest there for the summer, such as the short-toed eagle (Circaetus gallicus), the booted eagle (Hieraaetus pennatus), the Egyptian vulture (Neophron percnopterus), etc.